Western blot analysis of extracts from PC3 cells, untreated or treated with lambda phosphatase, using Phospho-Fox03a (Ser253) Antibody (upper) or Akt Antibody #9272 (lower). 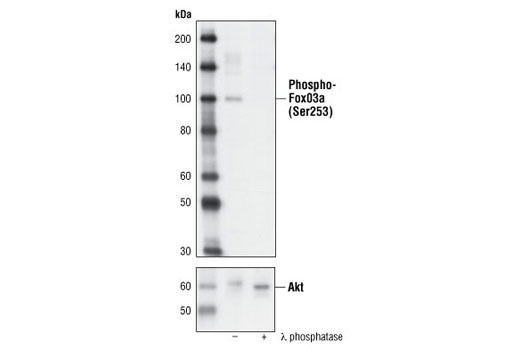 Phospho-Fox03a (Ser253) Antibody detects endogenous levels of Fox03a only when phosphorylated at serine 253. Polyclonal antibodies are produced by immunizing animals with a synthetic phosphopeptide corresponding to the sequence of human Fox03a. Antibodies are purified by protein A and peptide affinity chromatography. The Forkhead family of transcription factors is involved in tumorigenesis of rhabdomyosarcoma and acute leukemias (1-3). Within the family, three members (FoxO1, FoxO4, and FoxO3a) have sequence similarity to the nematode orthologue DAF-16, which mediates signaling via a pathway involving IGFR1, PI3K, and Akt (4-6). Active forkhead members act as tumor suppressors by promoting cell cycle arrest and apoptosis. Increased expression of any FoxO member results in the activation of the cell cycle inhibitor p27 Kip1. Forkhead transcription factors also play a part in TGF-β-mediated upregulation of p21 Cip1, a process negatively regulated through PI3K (7). Increased proliferation results when forkhead transcription factors are inactivated through phosphorylation by Akt at Thr24, Ser256, and Ser319, which results in nuclear export and inhibition of transcription factor activity (8). Forkhead transcription factors can also be inhibited by the deacetylase sirtuin (SirT1) (9). In Fox03a, the three sites phosphorylated by Akt mentioned above are Thr32, Ser253 and Ser315. Fox03a associates with 14-3-3 proteins upon phosphorylation by Akt and is retained in the cytoplasm. In the absence of survival factors, Fox03a is dephosphorylated, translocates to the nucleus and triggers cell death by a Fas ligand-dependent mechanism (7). Seoane, J. et al. (2004) Cell 117, 211-23. Yang, Y. et al. (2005) EMBO J 24, 1021-32.